For my first post, I wanted to do something a bit ambitious. Why not a notoriously complicated cake? Read on to find out… “You can totally make the Mondrian cake!” This is what Caitlin Freeman, pastry chef at The Blue Bottle Café in the San Francisco Museum of Modern Art, has been embossing on copies of her newly released book. Modern Art Desserts is a collection of Freeman’s stunning desserts inspired by modern artists. Jeff Koons, Roy Lichtenstein, Richard Avedon and, of course Piet Mondrian, all make an appearance. The infamously complicated Mondrian cake, which graces the cover of the book, is sold for $8 a slice in the SFMOMA café. Inspired by Freeman and Mondrian’s Composition C (No. III) with Red, Yellow and Blue (1935), I attempt to recreate a sweet slice of modern art with a few of my own additions. Note: I am using my own recipe, so this is not a review of Freeman’s book or her recipe. First, I decide on a cake recipe. It’s got to taste nice and be robust enough to withstand manhandling and lots of palette knife action. I adapt a simple pound cake recipe to include cream cheese for a tangier flavour. The chocolate ganache – the cement that holds the masterpiece together – consists of just double cream and dark chocolate. Designing the cake is next. I sketch out a simple design with the all-important red, yellow and blue squares. Maths has never been my strong point, so working out the dimensions and proportions is a challenge. Especially because, as I tend to eyeball measurements when I cook, I have no scales to weigh any of the ingredients out. Could this be the beginning of the nightmare? “It will be worth it,” I keep telling myself. Over the next few days, this becomes my mantra. I manage to work it out using a measuring jug and frantic Google searches for “cup of flour in grams”. The cake mix looks surprisingly good – light, fluffy and buttery.Perhaps all is not lost. I divvy up half of the cake batter into three smaller bowls and add the red, yellow and blue food colouring. The yellow and blue have to share a loaf tin, so I fashion a cardboard separator to keep the two apart, but this is a tricky operation. As I pour the yellow mix in it starts spewing around the edges. Desperately calling for help mid-pour, I’m relieved when my flatmate appears to hold the cardboard in place. 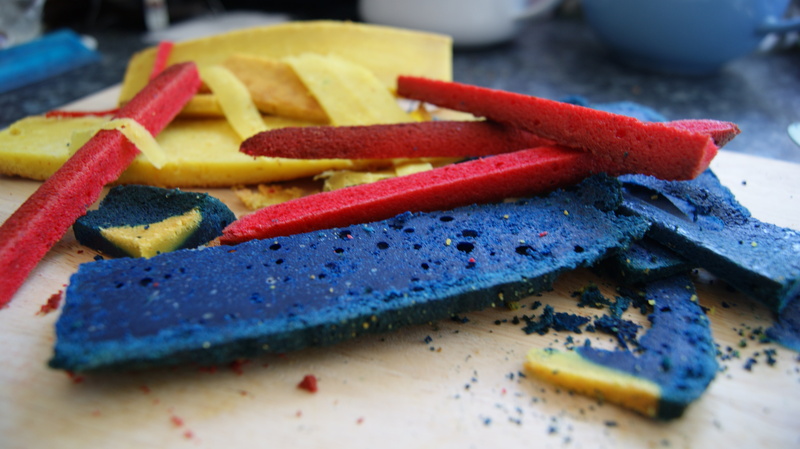 When I add the blue mixture, the cardboard steadies itself, but a significant amount of yellow mingles with it. Fingers crossed it doesn’t look too tie-dye. With the last bit of cake cooling on a rack, I feel a bit closer to the finish line. The yellow has only permeated the blue in one corner, which resembles a lava lamp, but I don’t fret too much. Carving is the next step. I’m beginning to realise just how crucial precision is to the success of the cake. The strips must be poker-straight and have razor-sharp edges. After a few adjustments and a bit of trimming, it all looks pretty good. I make the ganache and start sticking the long strips of cake together with it. I feel like a builder laying delicious, sweet bricks. I do all the ganache for the inside, interconnecting part of the cake. One tiny crack in a strip of plain cake causes it to crumble in two, and all I can do is hope it will stay in place. This almost pushes me over the edge. Exhausted, I call it a day. Tags: art, baking, blue bottle cafe, caitlin freeman, cake, dessert, food, ganache, mondrian, sfmoma, sweet. Bookmark the permalink. Totally awesome. can’t wait to see parts 2 and 3! Thanks – hopefully they won’t disappoint!